During my 2018 campaign I promised donors that in exchange for funding my campaign I would spend some time examining college entrance patterns for Piedmont grads. The effort turned out to be exactly as difficult as I had imagined. The District would not provide data for my study but did review the findings and provided feedback on possible explanations (page 10 of PDF). It took a lot of effort to coalesce data for graduating classes using 12 years of data from Piedmont Highlander voluntary surveys. College names had to be made consistent and there were a lot of missing values (Declined to State, Unreported, Undecided and Gap Year). The Piedmont Post and I contacted parents to help reduce the unknowns and we now have 92% of the data available. Please go ahead and download this PDF report by clicking: this link. No signup required. In my report the colleges listed are in order of declining total enrollment (sum) of the past 12 years in both the charts and table sections. To keep the report manageable, colleges with fewer than 7 total enrollments from Piedmont grads over the same 12 year period are not reported. All trend lines have confidence bands displayed. Only a handful of trends appear statistically significant, see page 9 of the PDF. 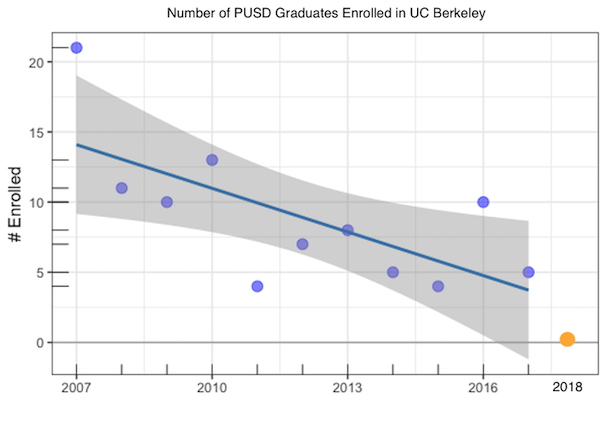 One of these trend changes appears to be with UC Berkeley. Over the past 12 years UC Berkeley (aka "Cal") was the "mode" or most common college that PHS students went to. UC Berkeley had 98 Piedmont graduates enrolled from 2007-17 and 0 in 2018. As another data point, Piedmont sent 3x more students to UC Berkeley from 2013-17 than Head Royce did. Many people who read the Piedmont Post over the years sensed a change in enrollment patterns and some commented that coalescing that data for this study and providing trend findings (page 9 of PDF) has real value and could be a precursor to understanding why these changes have taken place. The high school Wellness Center has approx 2000 complaints per year, the majority about academic performance. Has changing enrollment / acceptance patterns increased college applicant stress over 2007−18? If parents and students were aware of these changing patterns towards less academic/prestigious universities wouldn't that reduce applicant stress? If you know (with links to evidence) why Piedmont grad enrollment patterns have changed significantly, please enter your comments (with those links) below or contact me directly. My recommendation is PUSD should provide counts of Piedmont grads going to each college (a.k.a. matriculation data) annually and make it available on the PUSD website just like (partial list) Head Royce, College Prep, Palo Alto, Mission San Jose and Acalanes do. The district is about to receive a $75,000 grant to enhance college readiness. Goal 2 of the district LCAP states that "All Students will Graduate with the 21st Century Learning Skills Needed for College and Careers." College entrances are a measure of college readiness in that both the college and the student feel they are ready to take on the course load and requirements for the college degree. The district should adopt college matriculation counts as a metric to track. If you would like to contact the School Board regarding this issue, please send me a note or CC me on your email to the board.